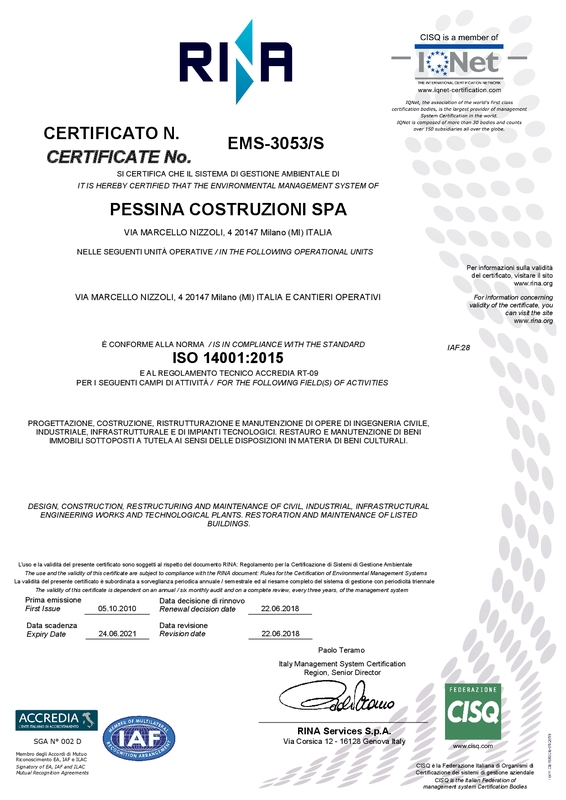 Pessina Costruzioni S.p.A. has the aim of achieving the customer satisfaction, with its strong capacity in building and management and a special focus and attention on safety and environment themes. 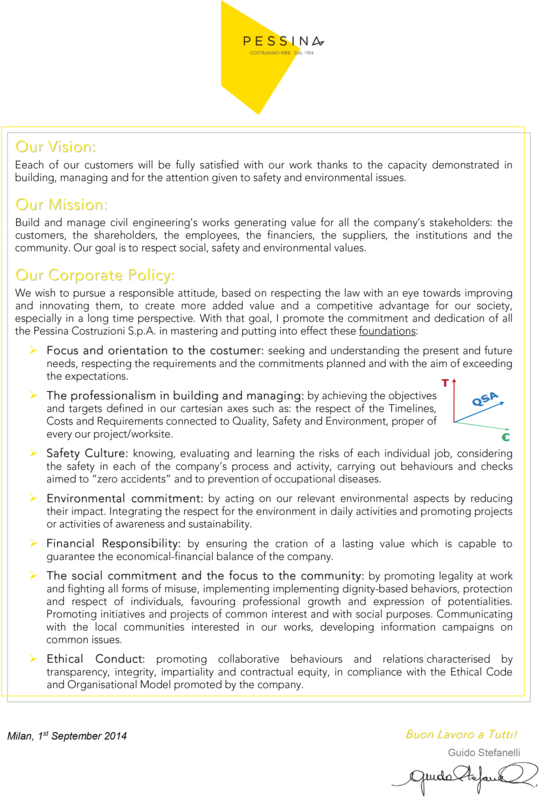 The company’s mission is to create great works useful to generate added value for the company stakeholders without lacking respect for social values, Health&Safety and environment protection. 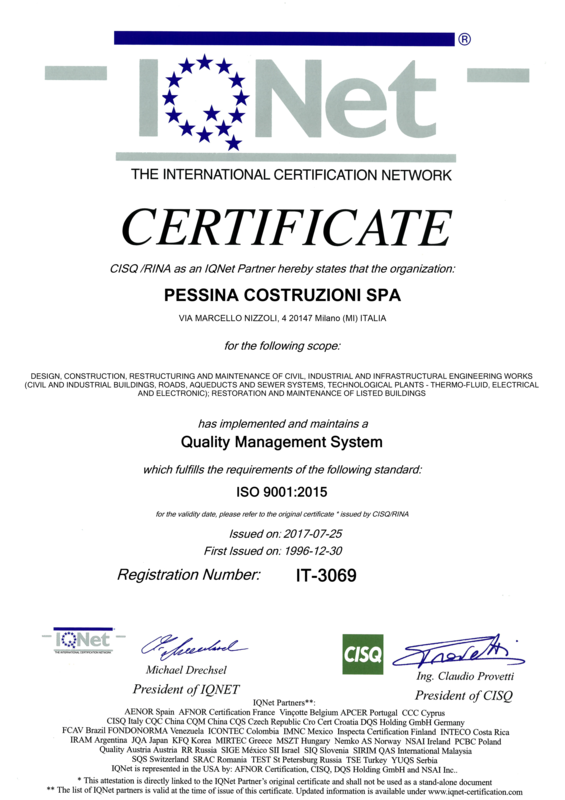 To achieve these goals and maintain them over time, we have been established a Management System for Quality, Safety and Environment (QHSE), certified by an independent organizations and recognized both nationally and internationally, in full compliance with the following universally recognized standards: ISO 9001, BS OHSAS 18001 and ISO 14001. 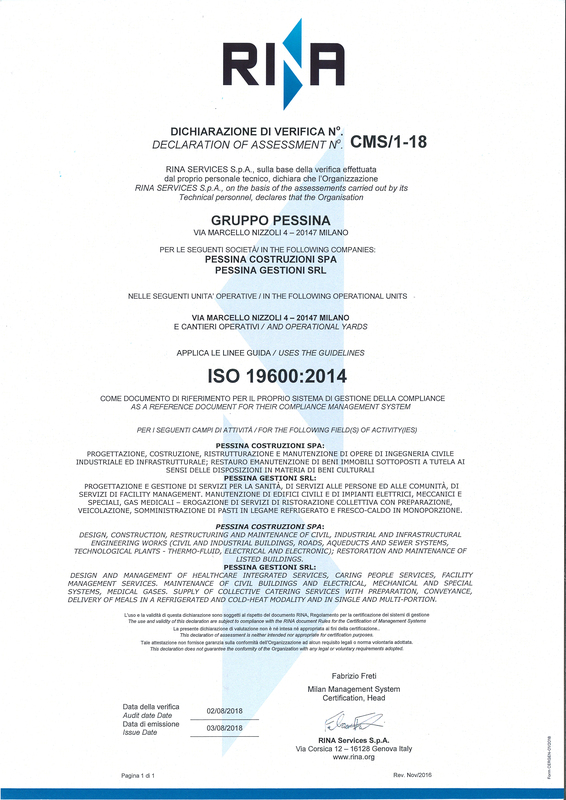 The field of reference of these certificates is the EA 28 sector (EA 28 a and EA 28 b). 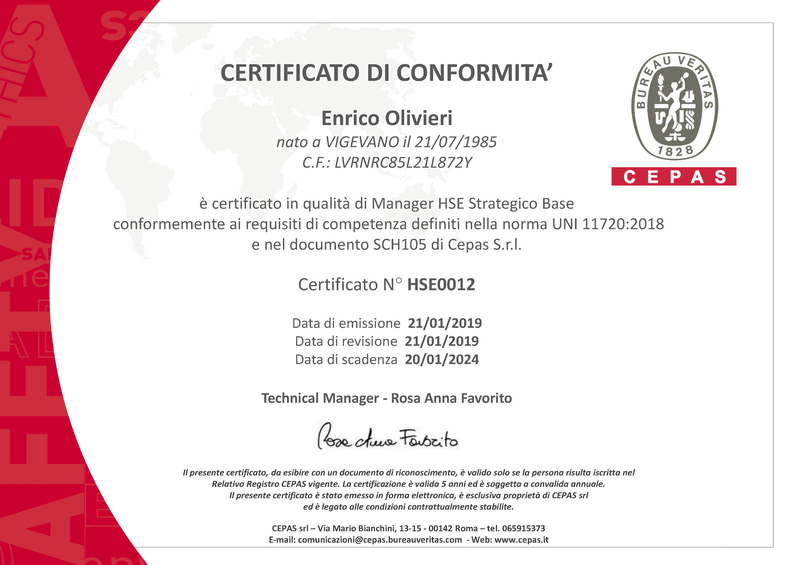 The QHSE Management System is based on principles, policies and processes managed in order to achieve continuous improvement in the capacity of the internal organization, in achieving its business targets. 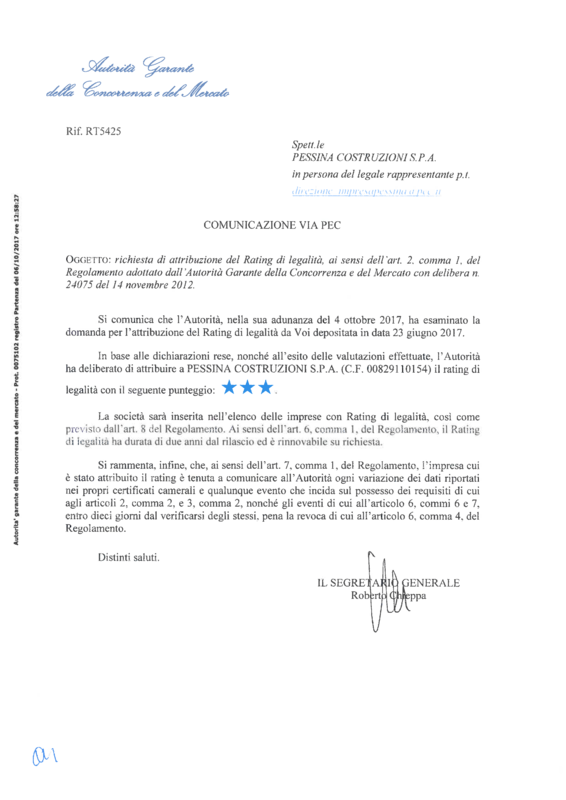 Pessina Construction on 6th October 2017 has received 3 stars on Rating of Legality, the best score achievable. 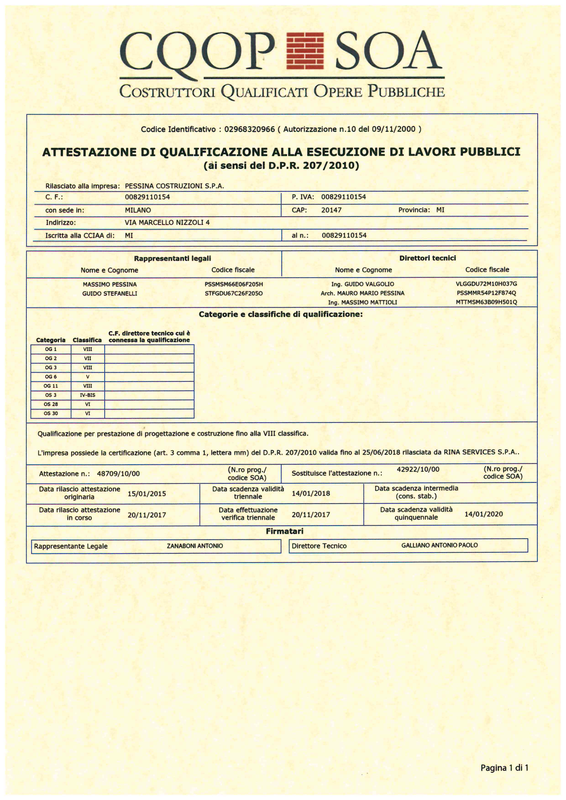 The Legality Rating was introduced in the Italian law with the aim of promoting the sharing of ethical principles in the field of entrepreneurship and to preventing illicit business conducts. 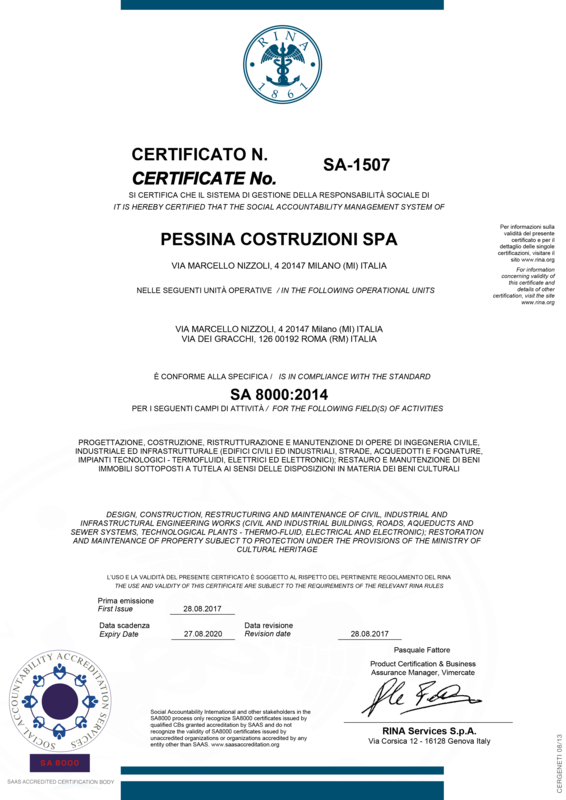 The Competition and Market Authority (AGCM) approved the regulation in November 2012, in accordance with the Ministry of Justice and the Ministry of Interior. The rating is attributed on the information given by the Company, that are verified with data held by public administrations involved in the control: Ministry of Interior, Ministry of Justice, ANAC, Advisory Committee. We consider the social aspect of the company and its responsibilities of extreme importance. 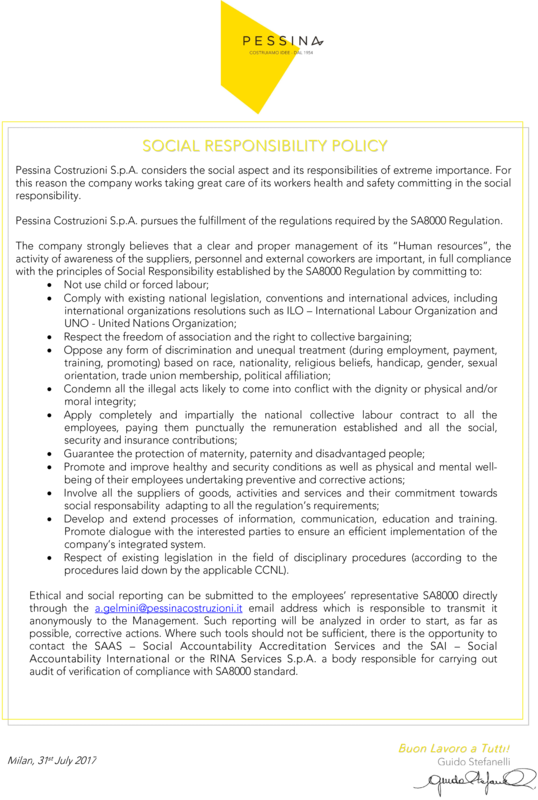 For this reason, our company works taking great care of its workers health and safety committing in the social responsibility. 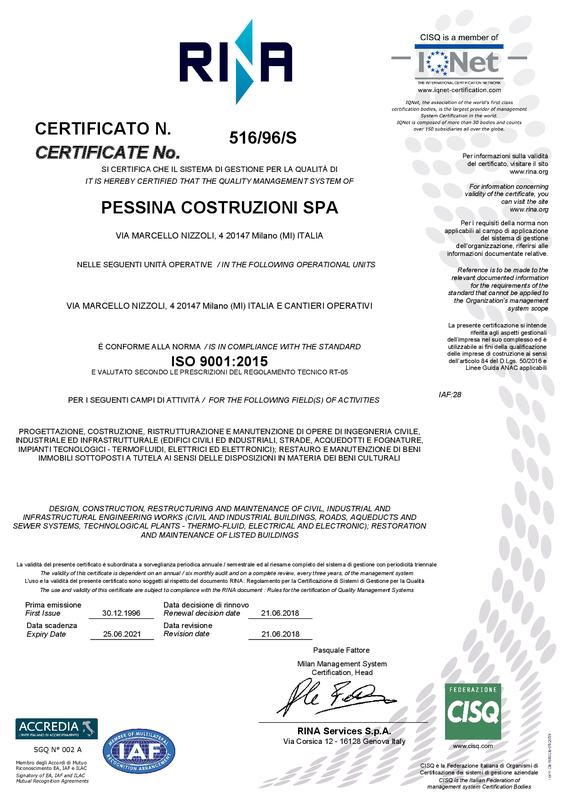 The reference sector of these certifications is EA 28: Construction Companies, Plant Installers and Services. 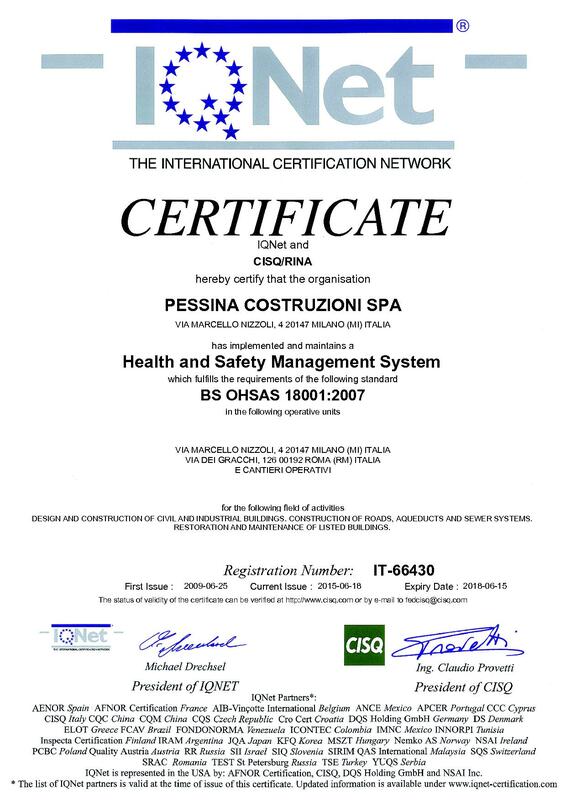 In addition to BS OHSAS 18001, another concrete result of our company’s attention, on Health&Safety topic is the attainment of the “Quality Site” certification in many construction company sites. 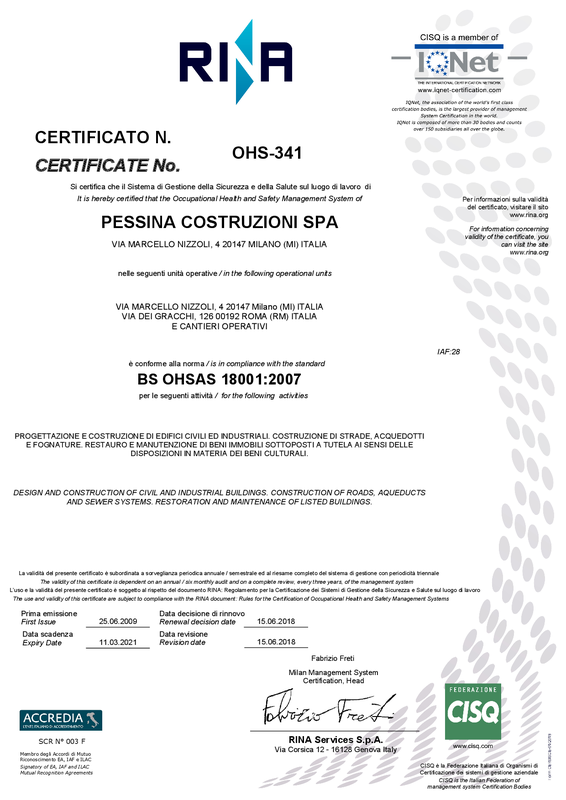 Pessina Costruzioni S.p.A. is the company that in Italy, obtained most of “Quality Site” certification related to construction sites. 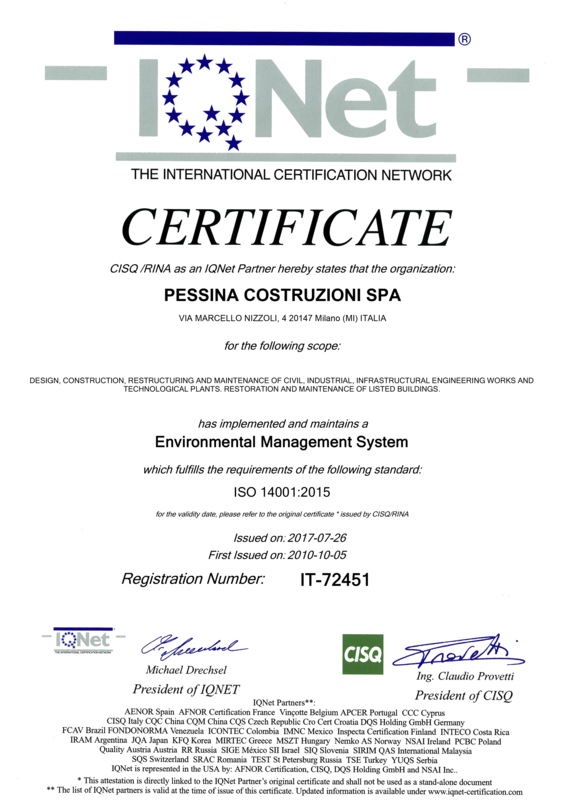 The “Quality Site” certification is issued by three important HSE Authorities: “ESEM, CPT, and CASSA EDILE”, only inside the territory of Milan, Monza and Brianza. These HSE Authorities endorse, after the good results of systematic audits, the high level of performance obtained in specific construction sites, in relation to Heath&Safety, Training and Regular Payment of the salaries.